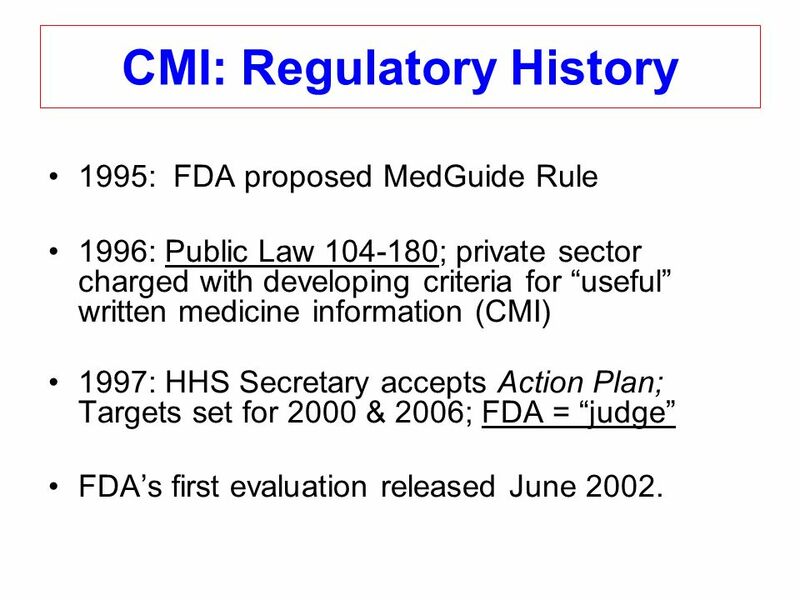 6 CMI: Regulatory History 1995: FDA proposed MedGuide Rule 1996: Public Law 104-180; private sector charged with developing criteria for useful written medicine information (CMI) 1997: HHS Secretary accepts Action Plan; Targets set for 2000 & 2006; FDA = judge FDAs first evaluation released June 2002. 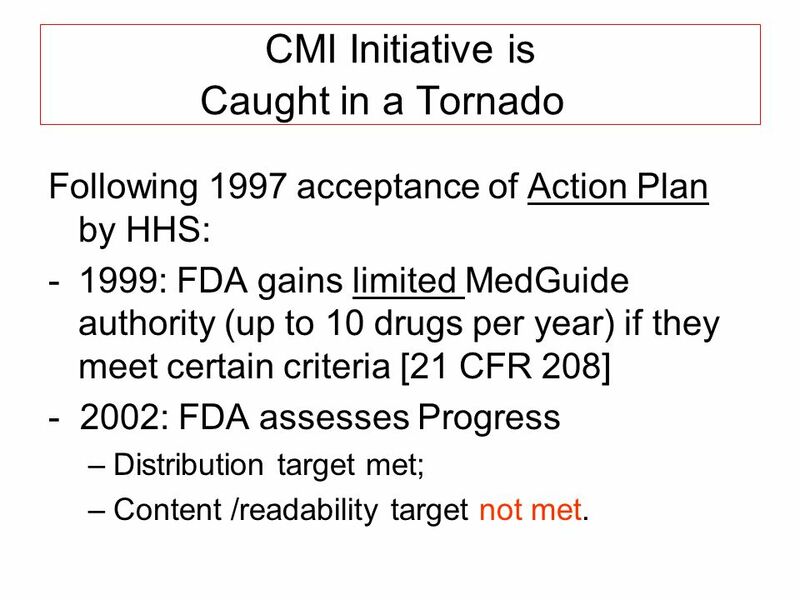 16 CMI Initiative is Caught in a Tornado Following 1997 acceptance of Action Plan by HHS: -1999: FDA gains limited MedGuide authority (up to 10 drugs per year) if they meet certain criteria [21 CFR 208] - 2002: FDA assesses Progress –Distribution target met; –Content /readability target not met. 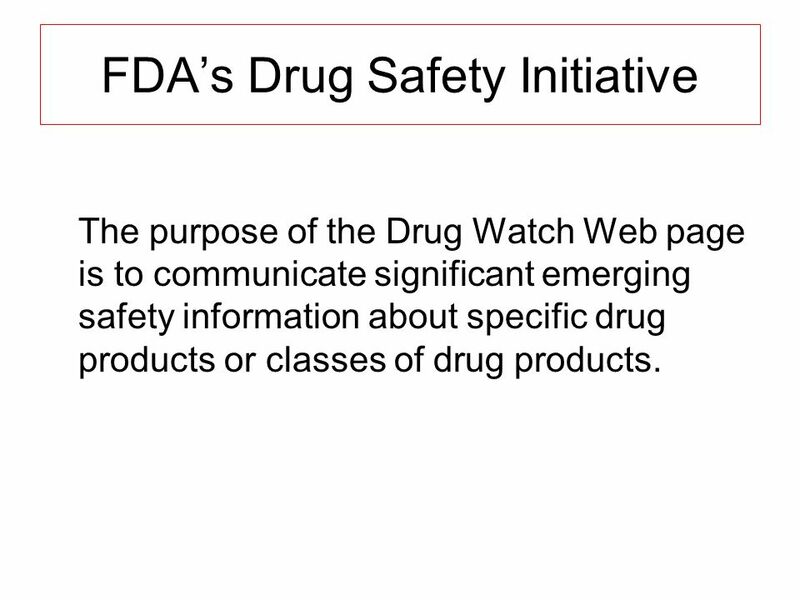 19 FDAs Drug Safety Initiative The purpose of the Drug Watch Web page is to communicate significant emerging safety information about specific drug products or classes of drug products. 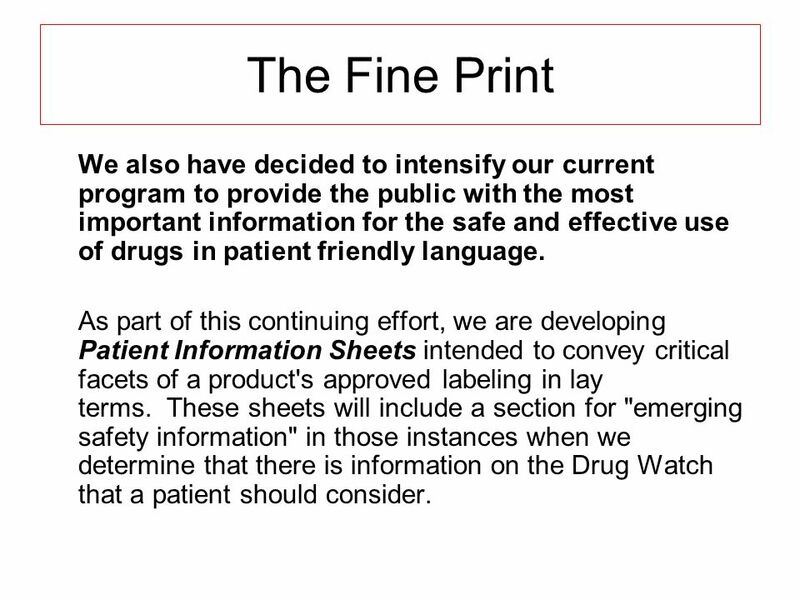 22 The Fine Print We also have decided to intensify our current program to provide the public with the most important information for the safe and effective use of drugs in patient friendly language. 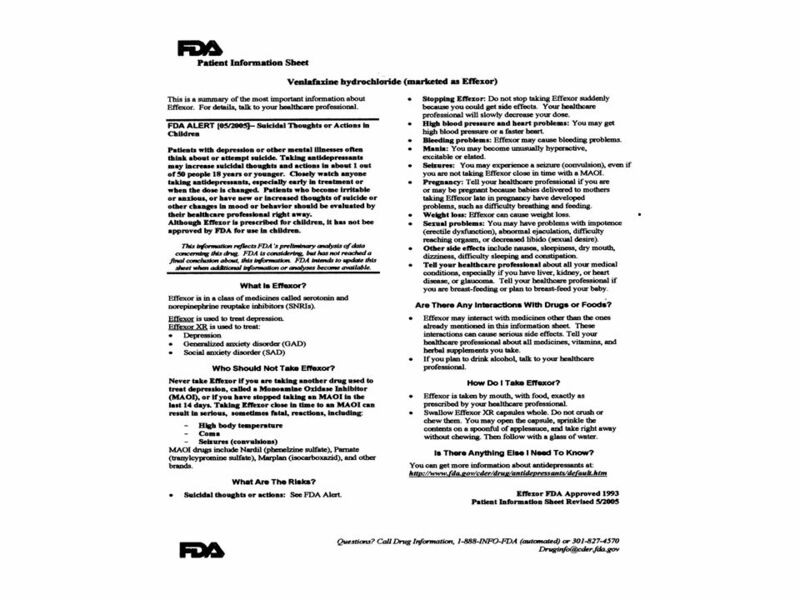 As part of this continuing effort, we are developing Patient Information Sheets intended to convey critical facets of a product's approved labeling in lay terms. 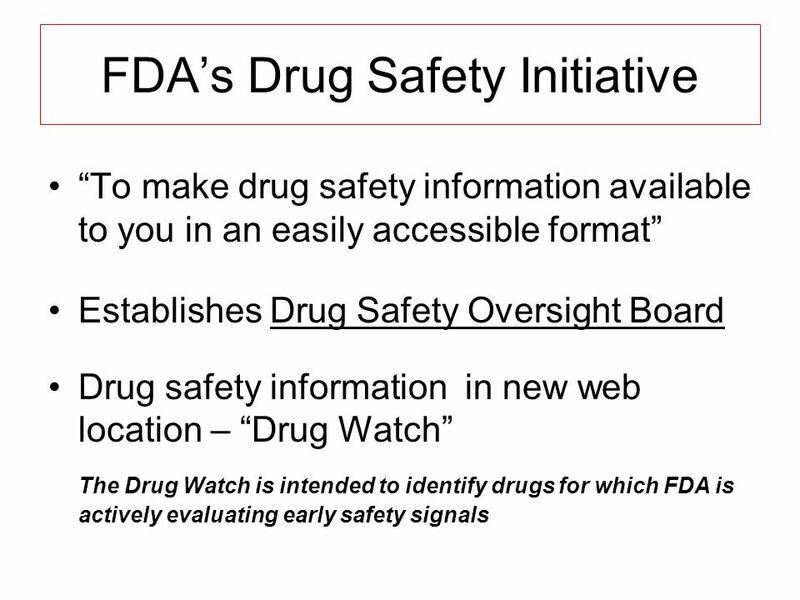 These sheets will include a section for "emerging safety information" in those instances when we determine that there is information on the Drug Watch that a patient should consider. 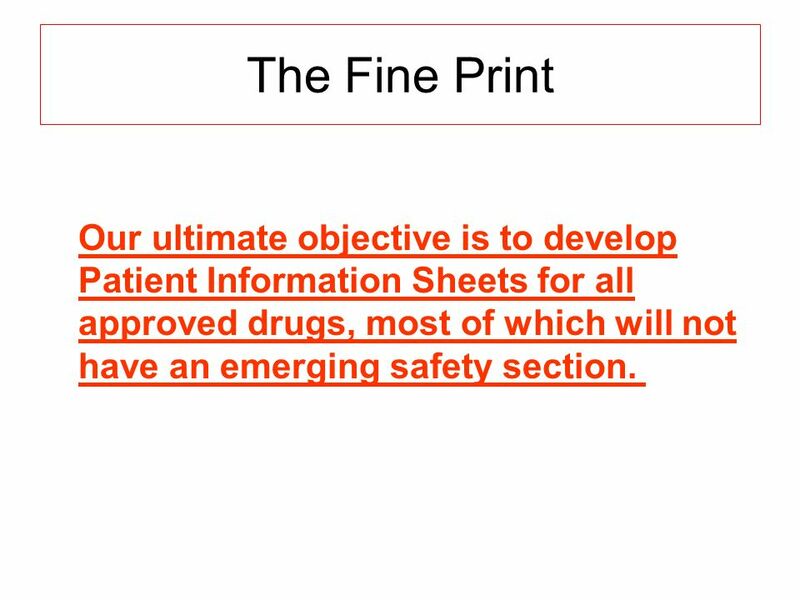 23 The Fine Print Our ultimate objective is to develop Patient Information Sheets for all approved drugs, most of which will not have an emerging safety section. 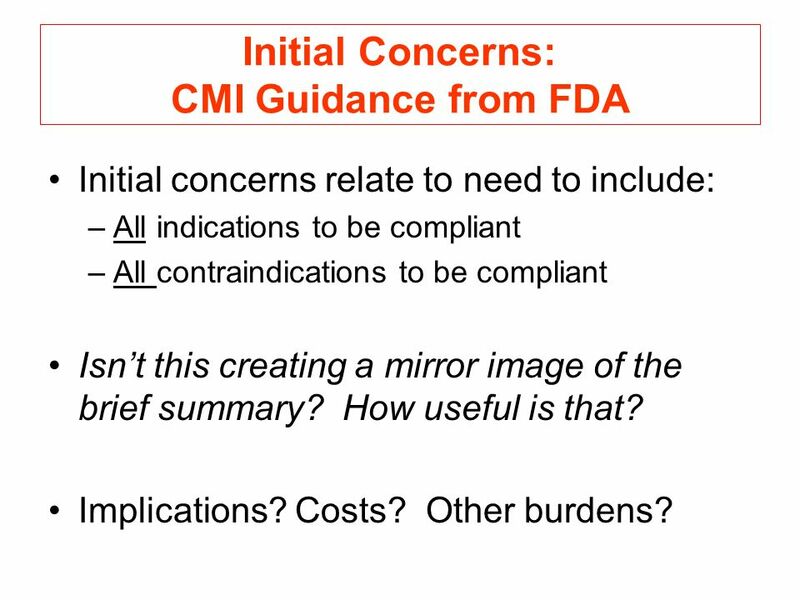 25 Initial Concerns: CMI Guidance from FDA Initial concerns relate to need to include: –All indications to be compliant –All contraindications to be compliant Isnt this creating a mirror image of the brief summary? How useful is that? Implications? 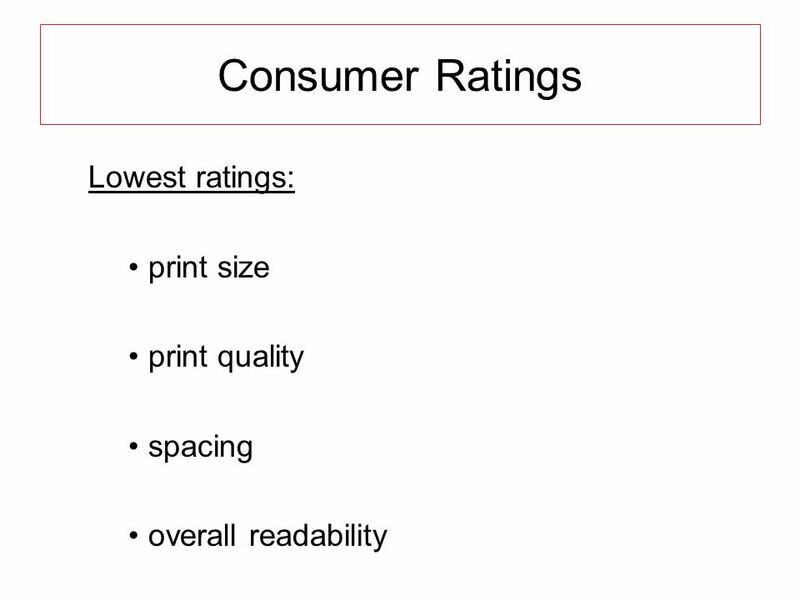 Costs? Other burdens? 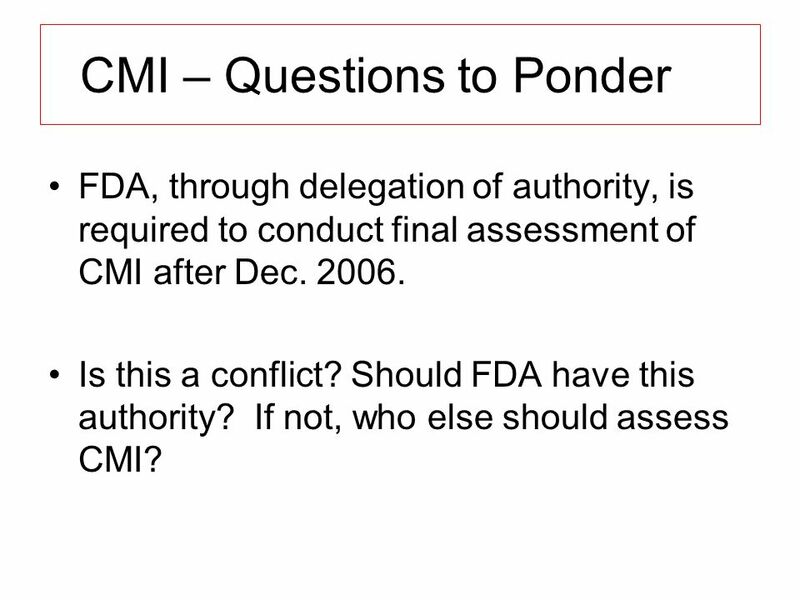 27 CMI – Questions to Ponder FDA, through delegation of authority, is required to conduct final assessment of CMI after Dec. 2006. Is this a conflict? 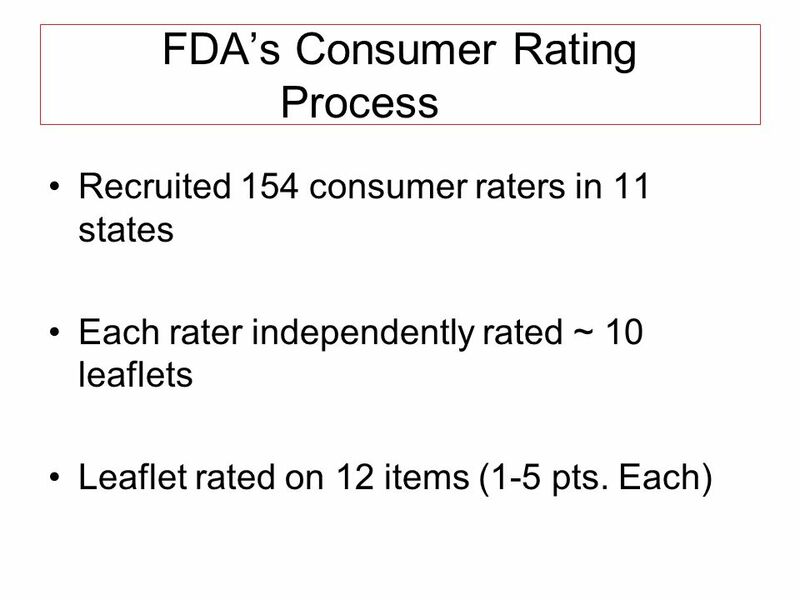 Should FDA have this authority? 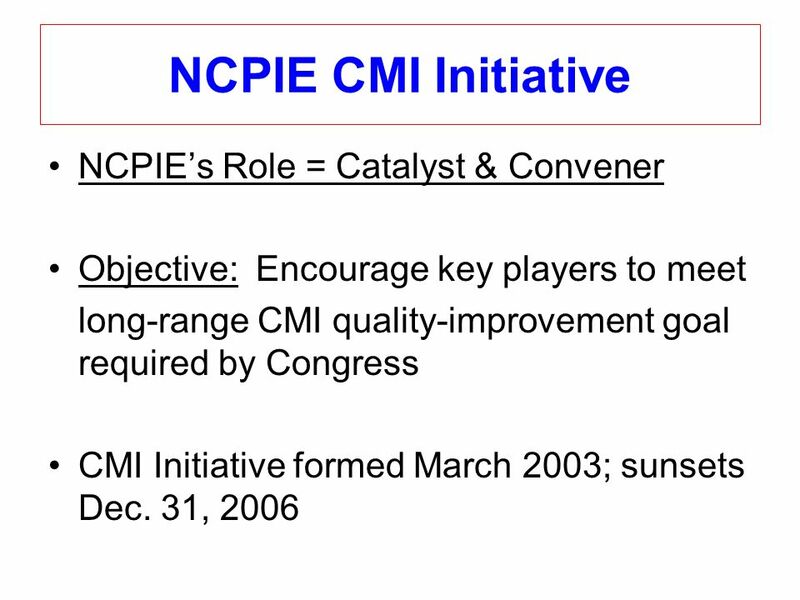 If not, who else should assess CMI? 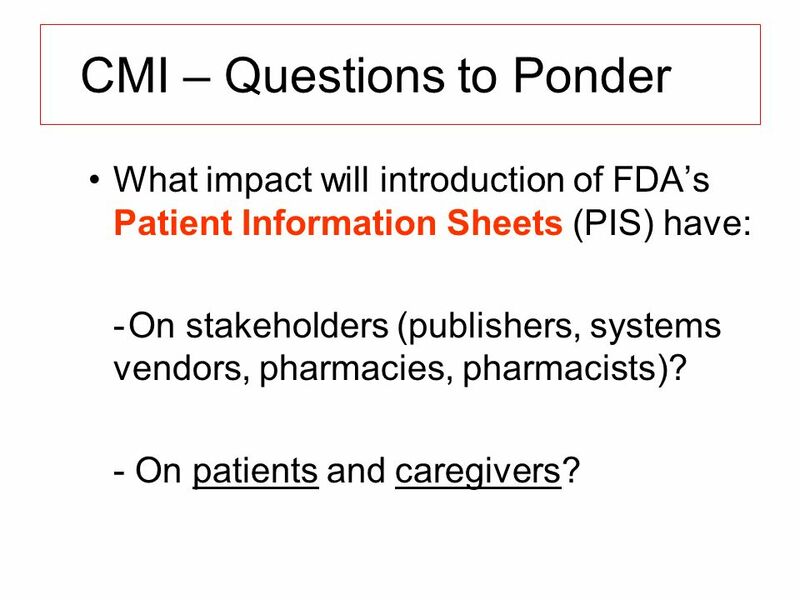 28 CMI – Questions to Ponder What impact will introduction of FDAs Patient Information Sheets (PIS) have: -On stakeholders (publishers, systems vendors, pharmacies, pharmacists)? - On patients and caregivers? 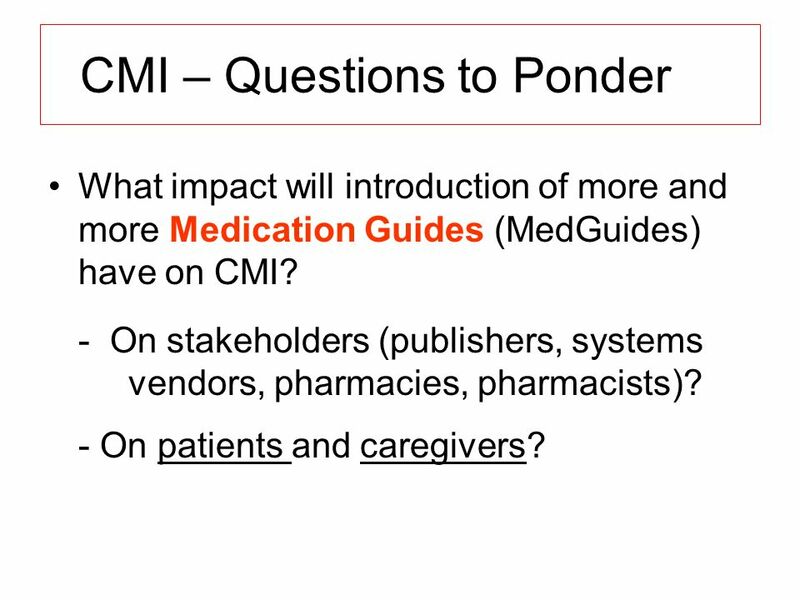 29 CMI – Questions to Ponder What impact will introduction of more and more Medication Guides (MedGuides) have on CMI? 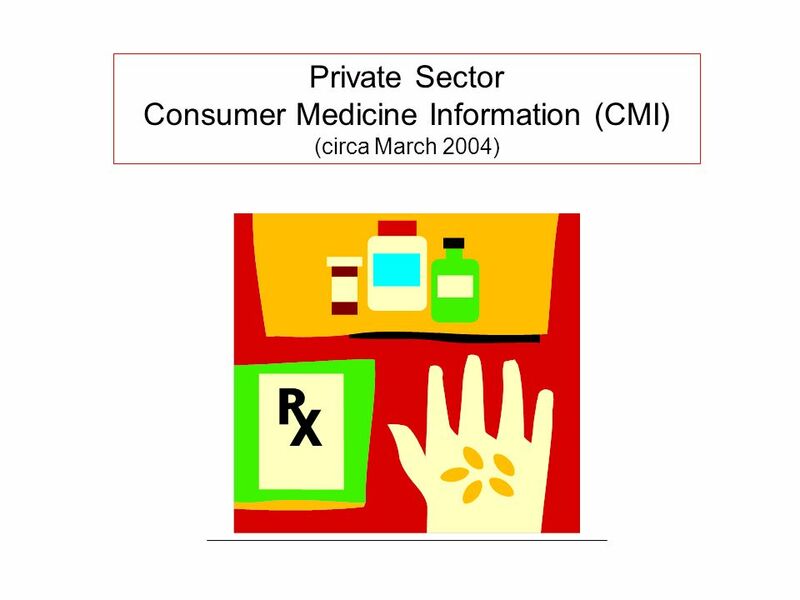 - On stakeholders (publishers, systems vendors, pharmacies, pharmacists)? 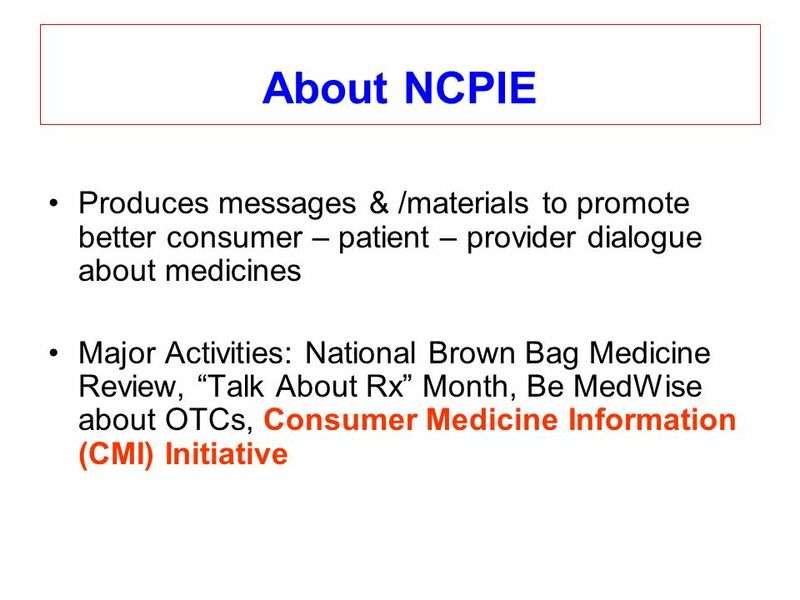 - On patients and caregivers? 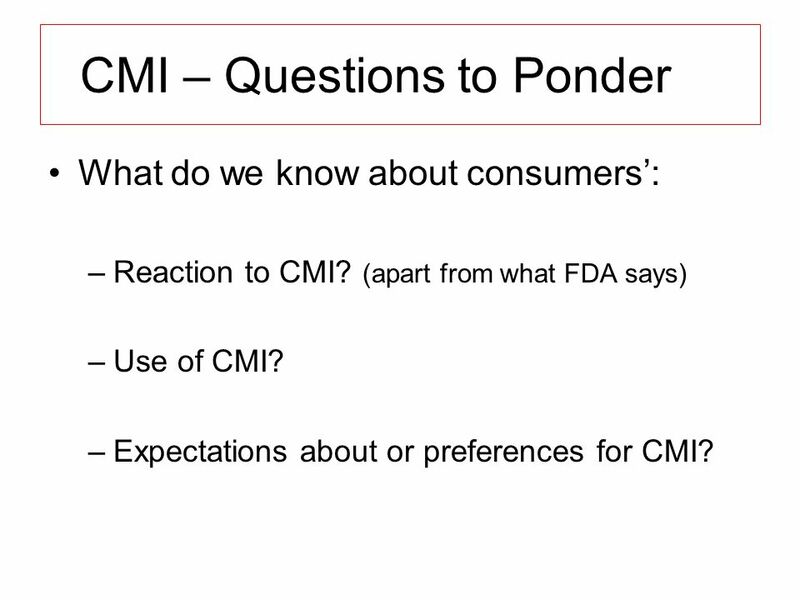 30 CMI – Questions to Ponder What do we know about consumers: –Reaction to CMI? 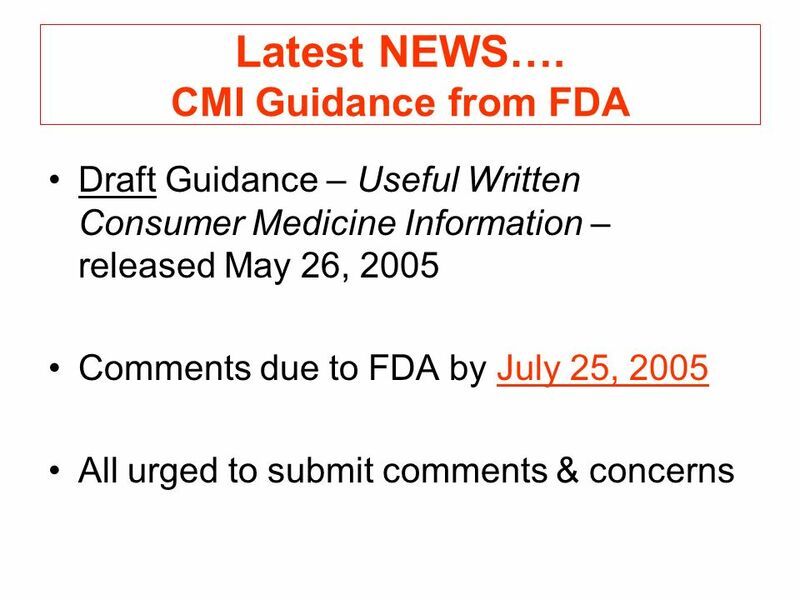 (apart from what FDA says) –Use of CMI? 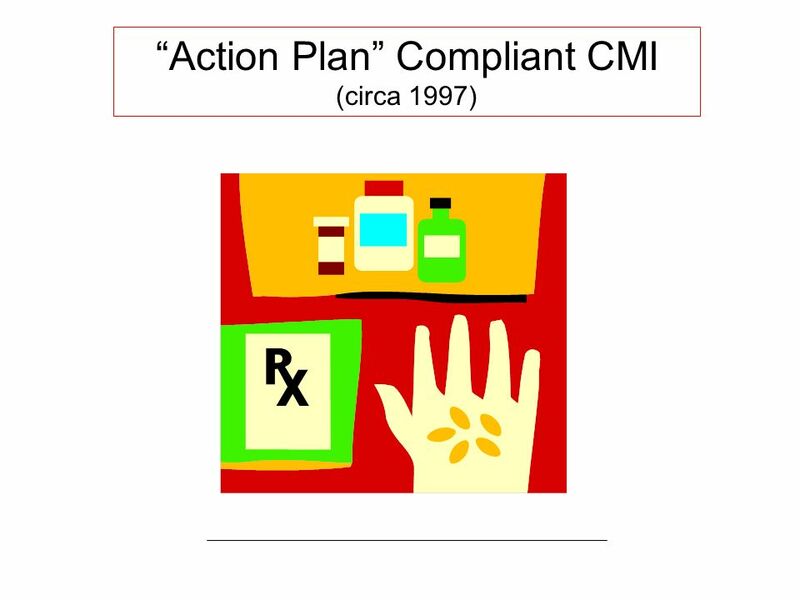 –Expectations about or preferences for CMI? 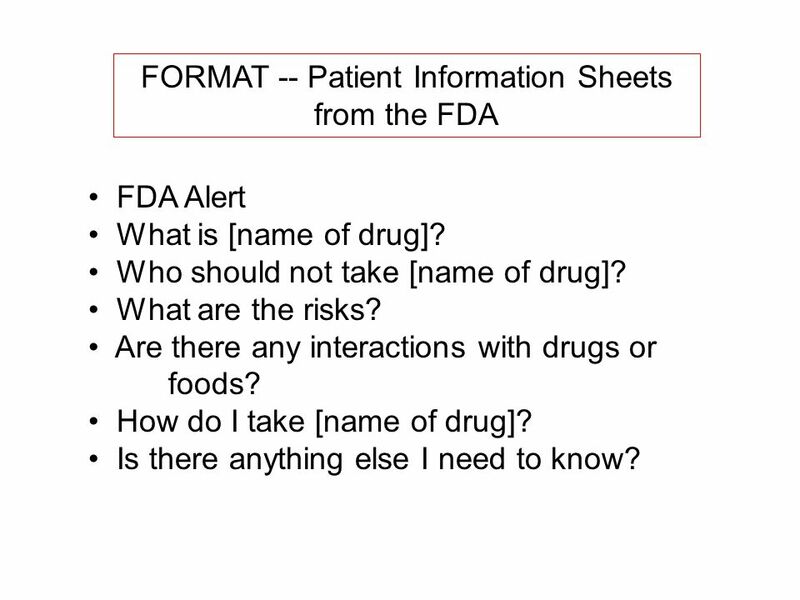 39 FORMAT -- Patient Information Sheets from the FDA FDA Alert What is [name of drug]? 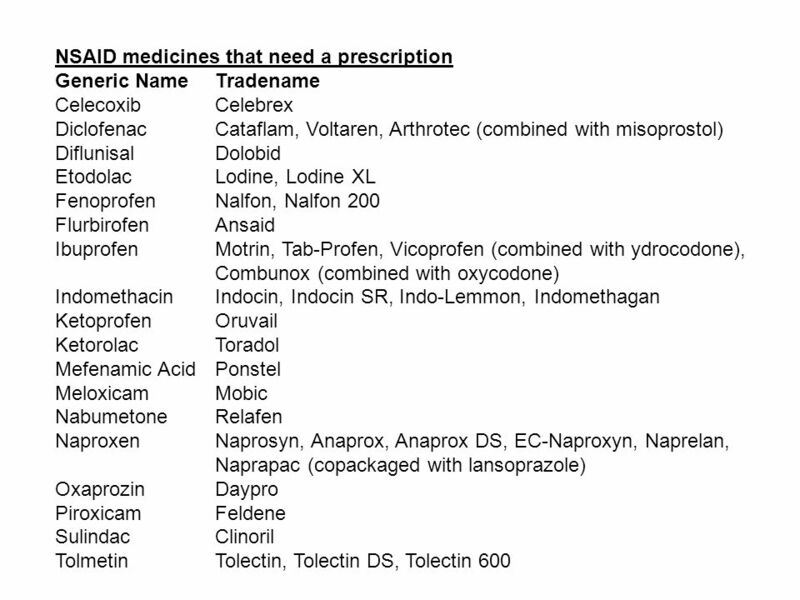 Who should not take [name of drug]? What are the risks? Are there any interactions with drugs or foods? 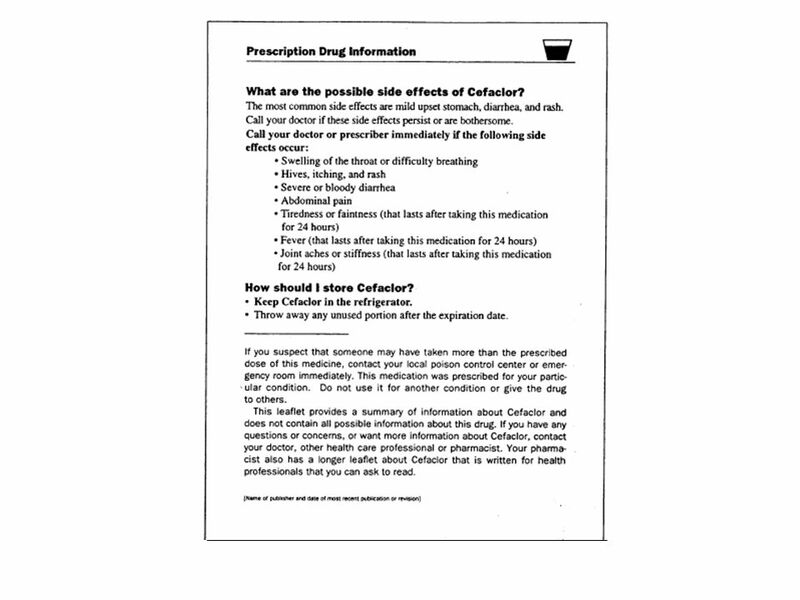 How do I take [name of drug]? Is there anything else I need to know? 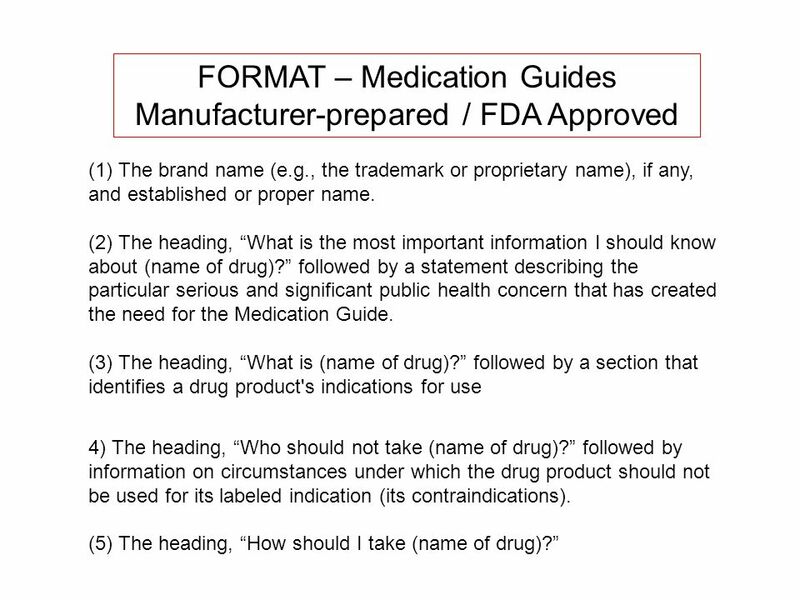 42 FORMAT – Medication Guides Manufacturer-prepared / FDA Approved (1) The brand name (e.g., the trademark or proprietary name), if any, and established or proper name. 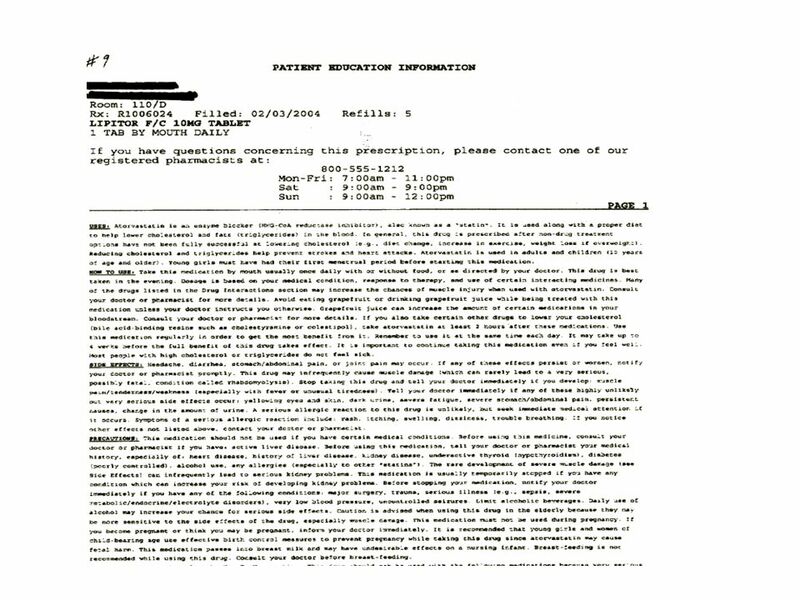 (2) The heading, What is the most important information I should know about (name of drug)? 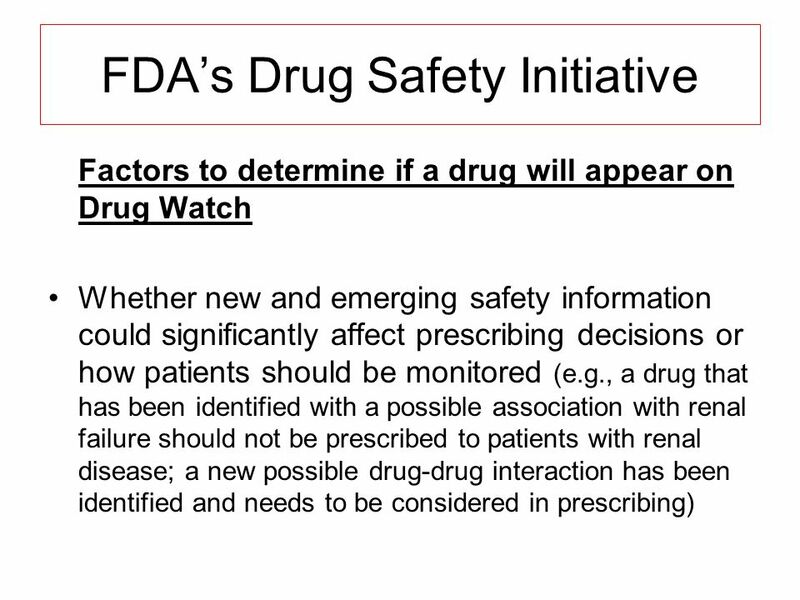 followed by a statement describing the particular serious and significant public health concern that has created the need for the Medication Guide. 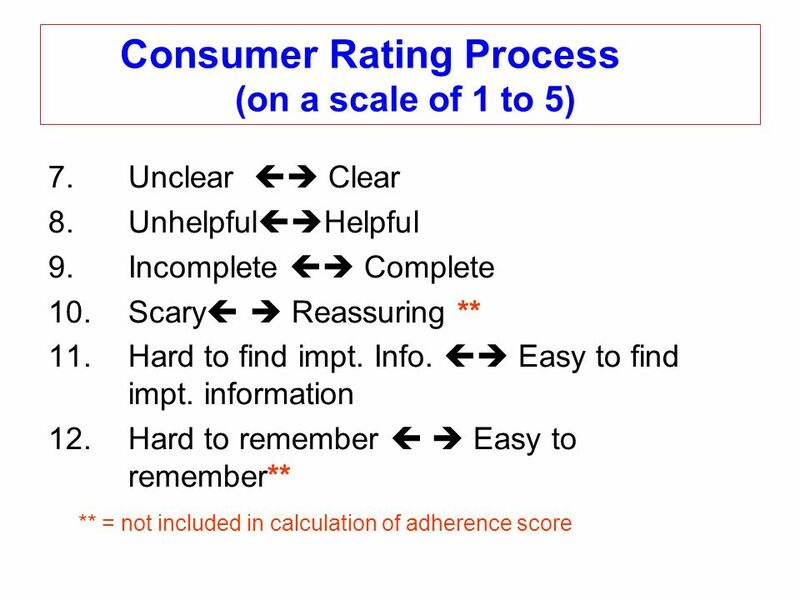 (3) The heading, What is (name of drug)? 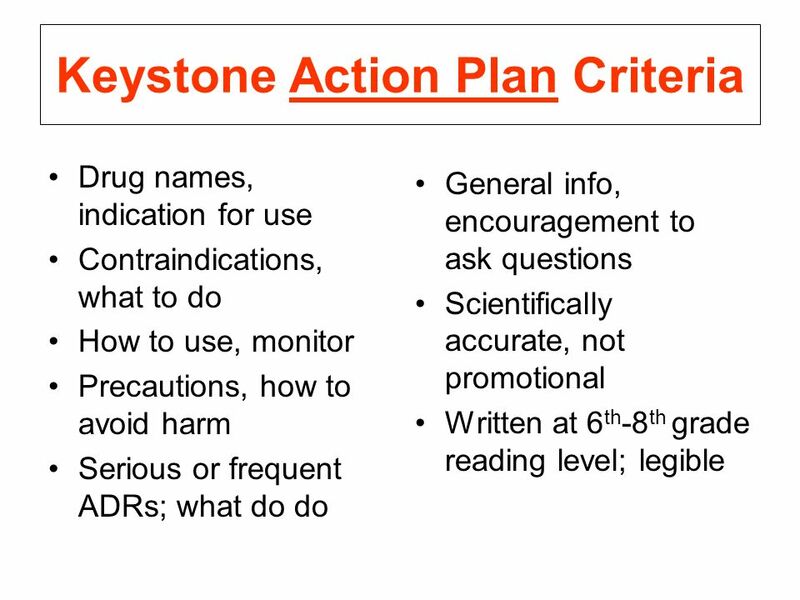 followed by a section that identifies a drug product's indications for use 4) The heading, Who should not take (name of drug)? 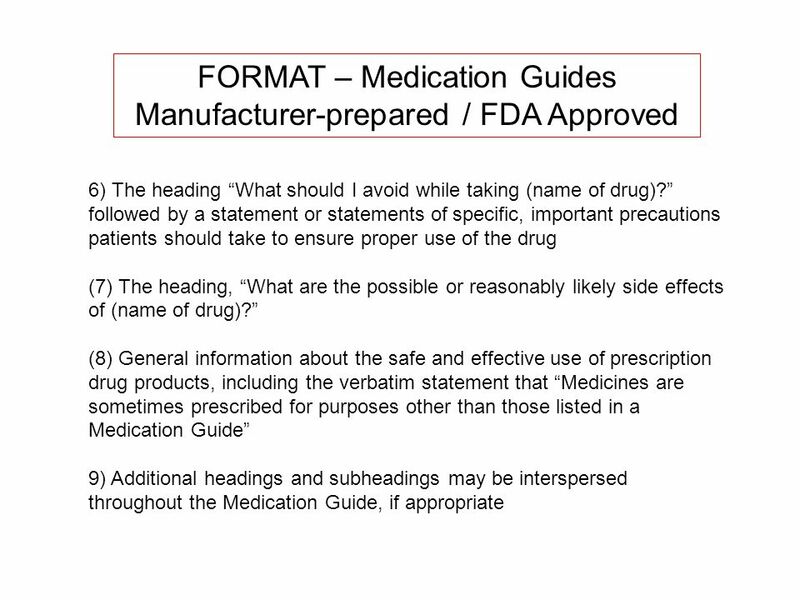 followed by information on circumstances under which the drug product should not be used for its labeled indication (its contraindications). 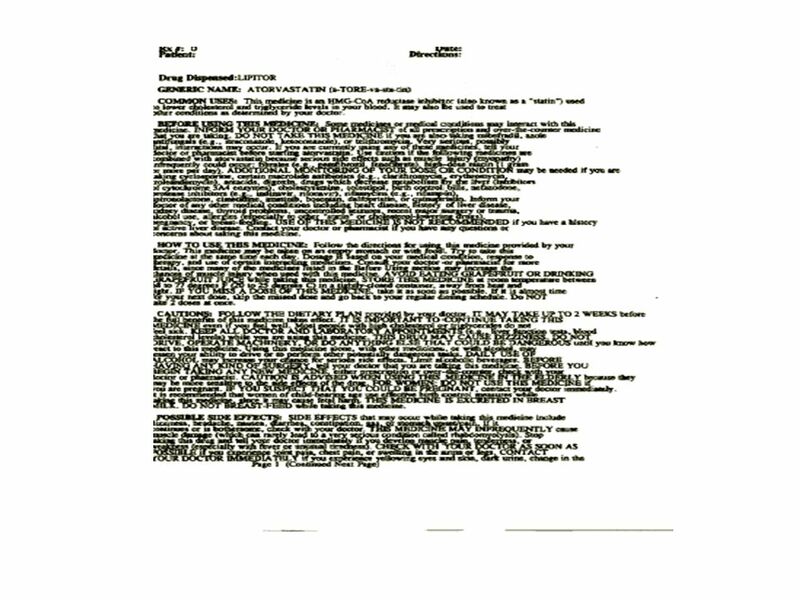 (5) The heading, How should I take (name of drug)? 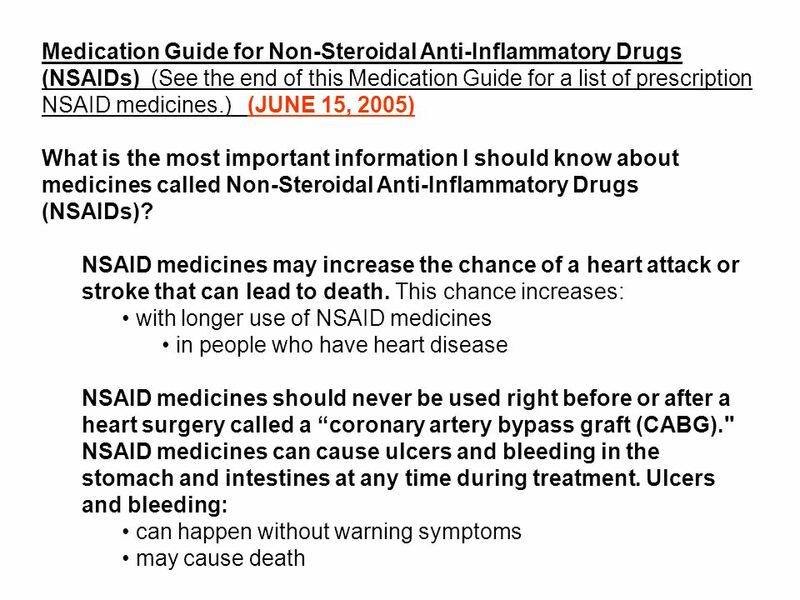 46 Who should not take a Non-Steroidal Anti-Inflammatory Drug (NSAID)? 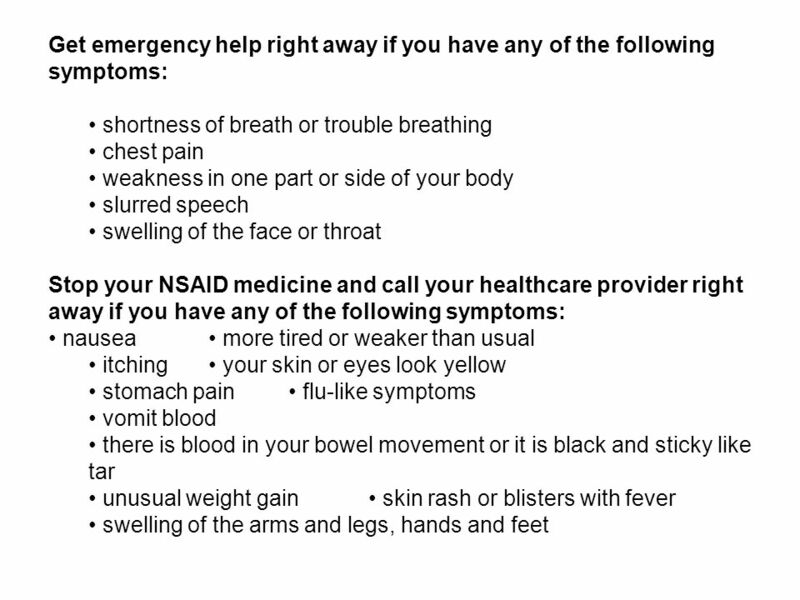 Do not take an NSAID medicine: if you had an asthma attack, hives, or other allergic reaction with aspirin or any other NSAID medicine for pain right before or after heart bypass surgery Tell your healthcare provider: about all of your medical conditions. 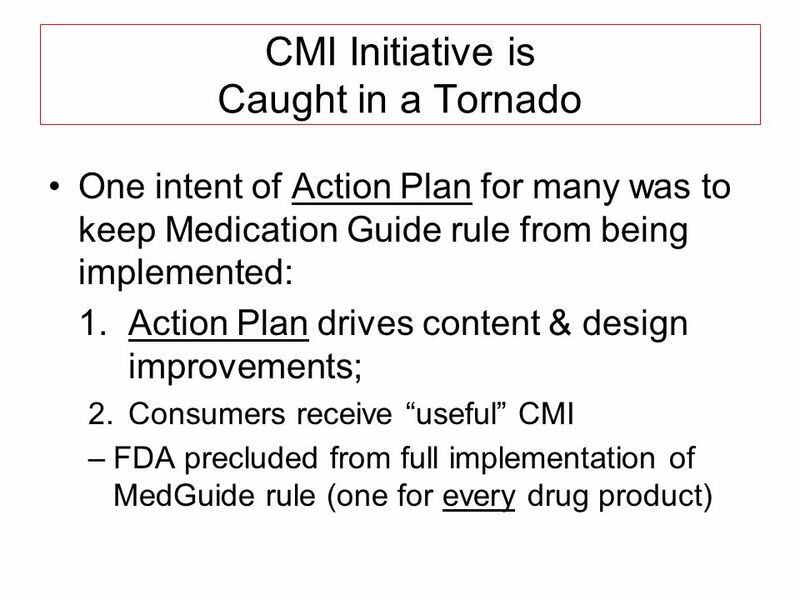 about all of the medicines you take. 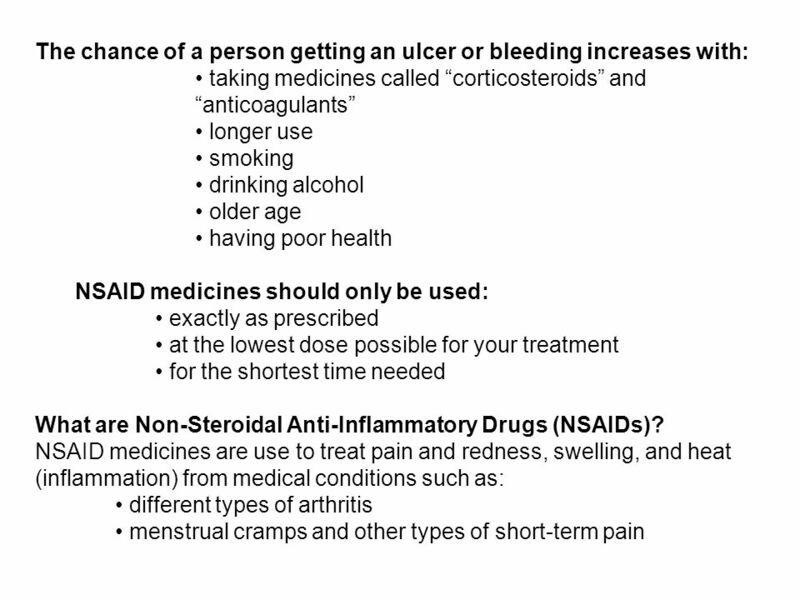 NSAIDs and some other medicines can interact with each other and cause serious side effects. 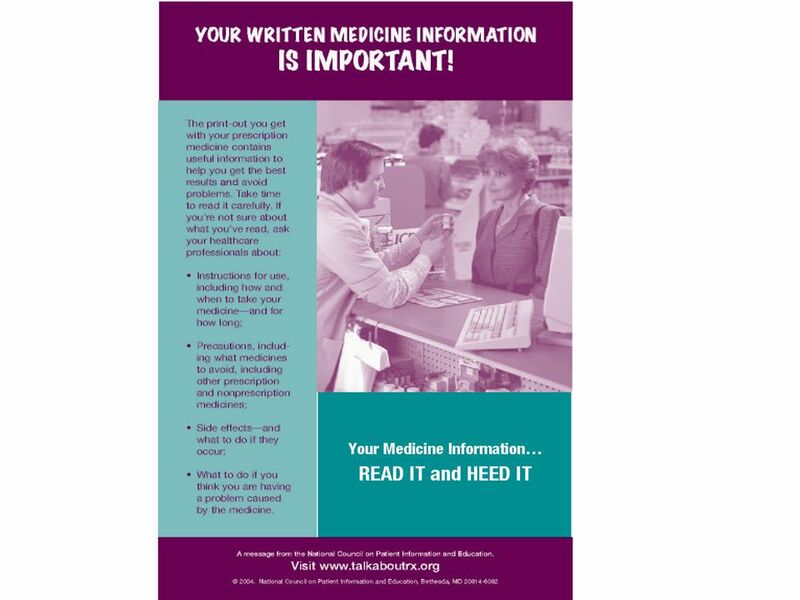 Keep a list of your medicines to show to your healthcare provider and pharmacist. if you are pregnant. 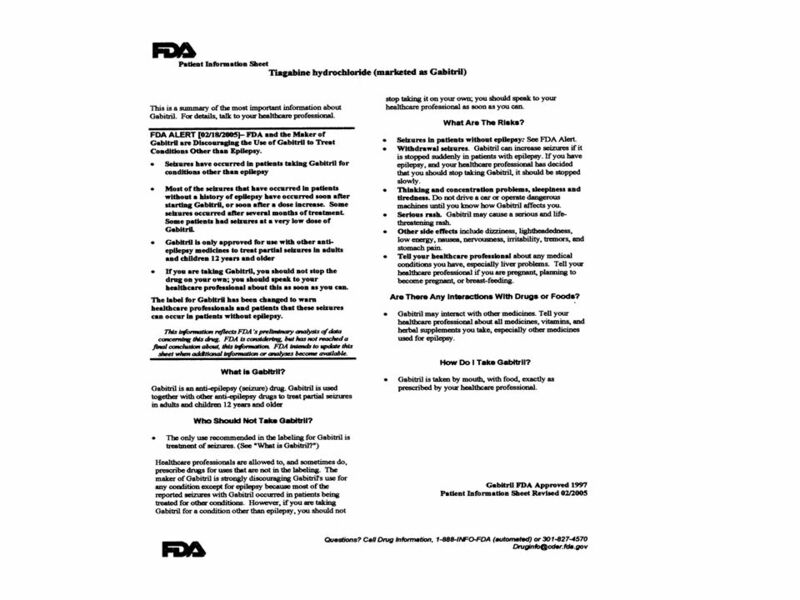 NSAID medicines should not be used by pregnant women late in their pregnancy. if you are breastfeeding. Talk to your doctor. 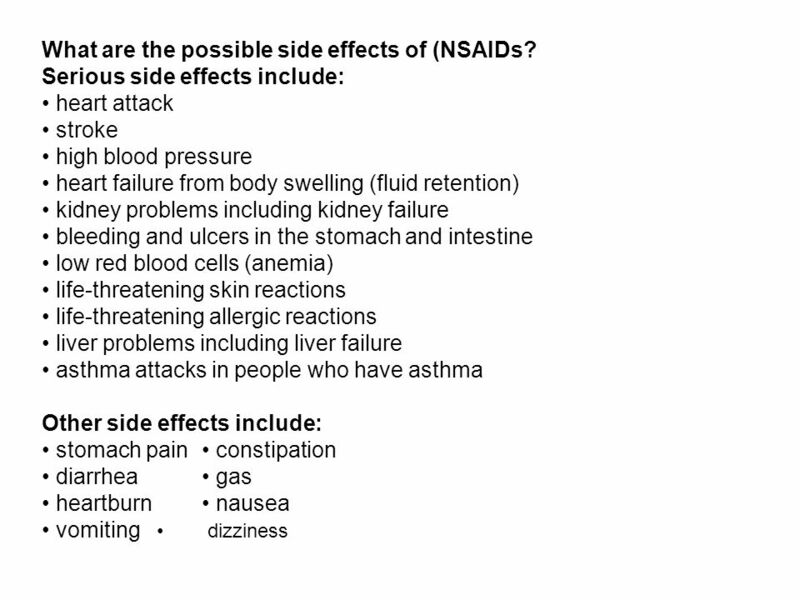 49 These are not all the side effects with NSAID medicines. 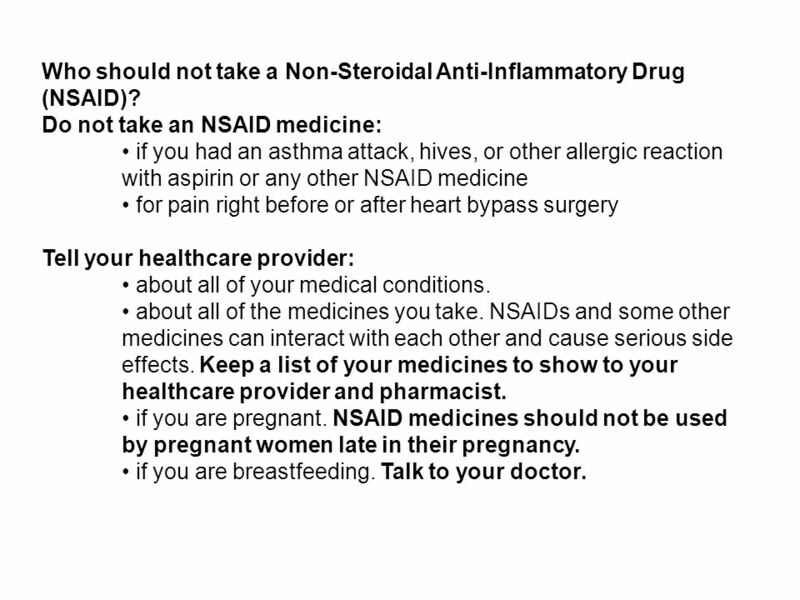 Talk to your healthcare provider or pharmacist for more information about NSAID medicines. 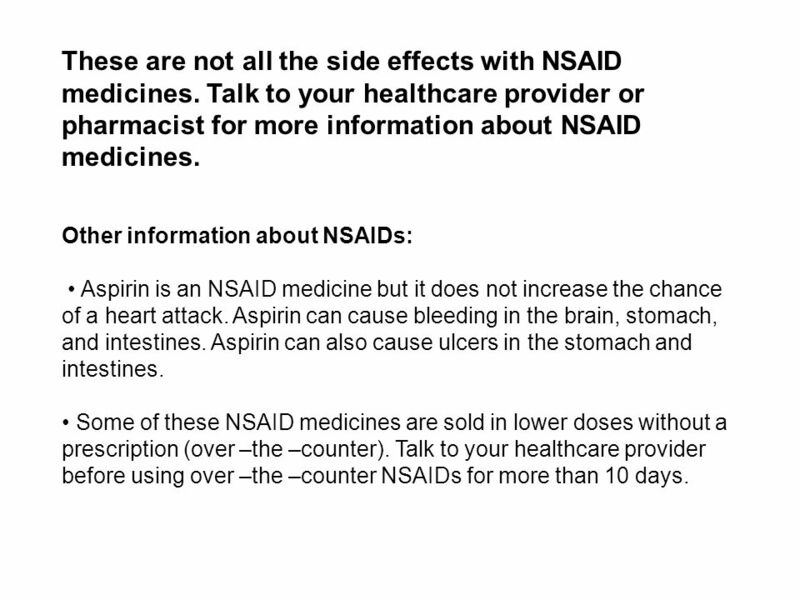 Other information about NSAIDs: Aspirin is an NSAID medicine but it does not increase the chance of a heart attack. Aspirin can cause bleeding in the brain, stomach, and intestines. Aspirin can also cause ulcers in the stomach and intestines. 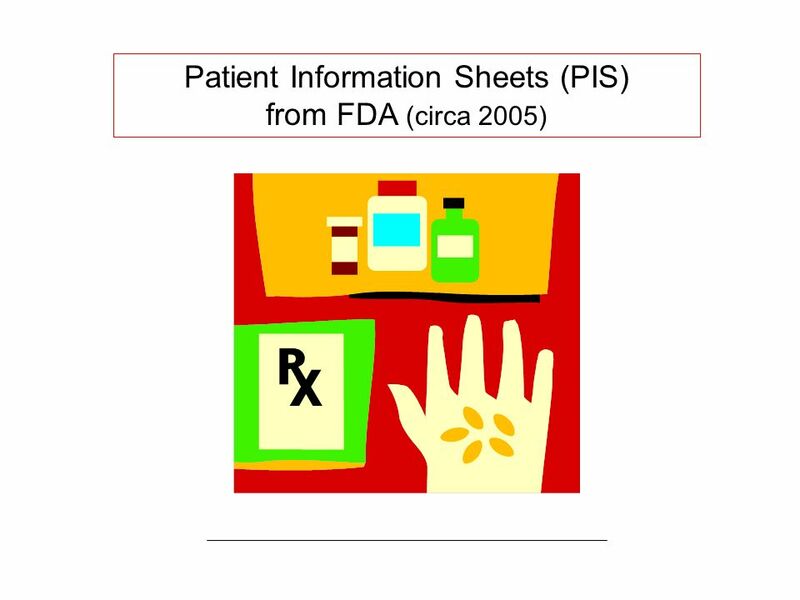 Some of these NSAID medicines are sold in lower doses without a prescription (over –the –counter). Talk to your healthcare provider before using over –the –counter NSAIDs for more than 10 days. 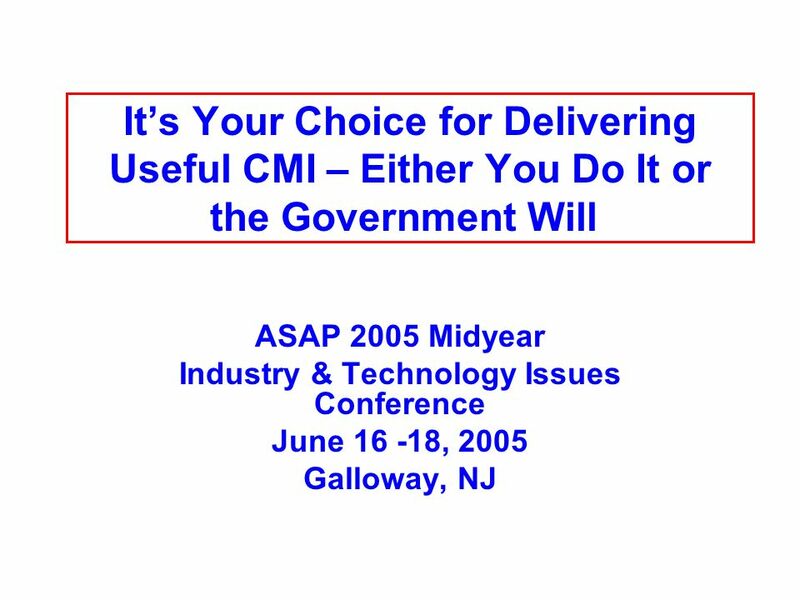 Download ppt "Its Your Choice for Delivering Useful CMI – Either You Do It or the Government Will ASAP 2005 Midyear Industry & Technology Issues Conference June 16 -18,"
Partners in Crime: Your Pharmacist Sarah A. Spinler, PharmD, FCCP,FAHA, FASHP, BCPS (AQ Cardiology) Professor of Clinical Pharmacy Philadelphia College. ASAP 2011 Annual Industry & Technology Issues Conference On the Same Page? 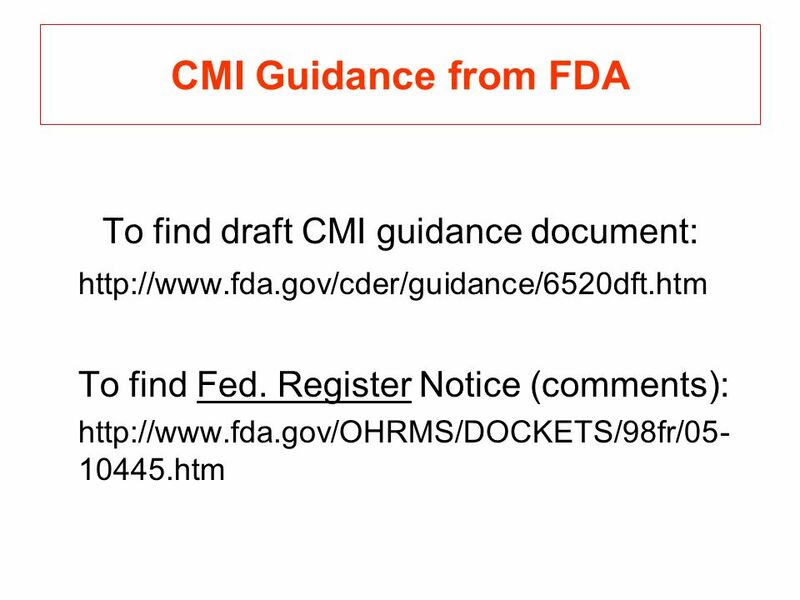 FDA, Brookings Institution and the Quest for a Single-Document Solution for. 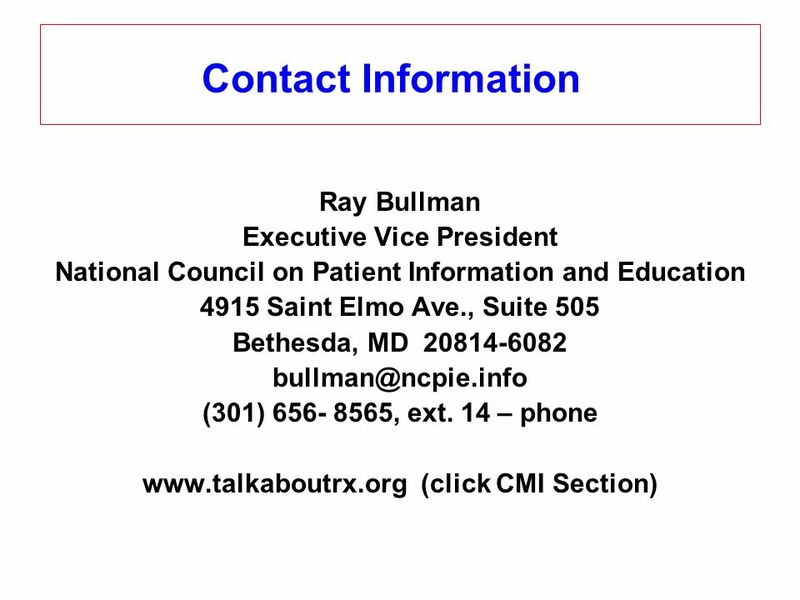 Collegiate Prescription Drug Abuse Prevention Conference The Ohio State University August 8, 2012 Ray Bullman National Council on Patient Information and. 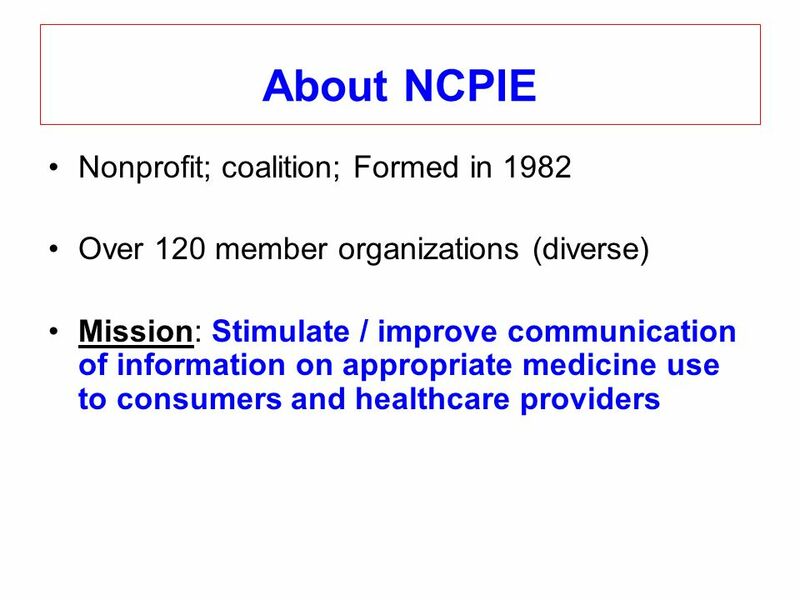 NCPIE, Copyright 2007 Written Drug Information: Now & into the Future A look at where things now stand with the provision of useful written information. Warfarin, Insulin and Digoxin are the most Dangerous drugs in the elderly. Do we believe that? 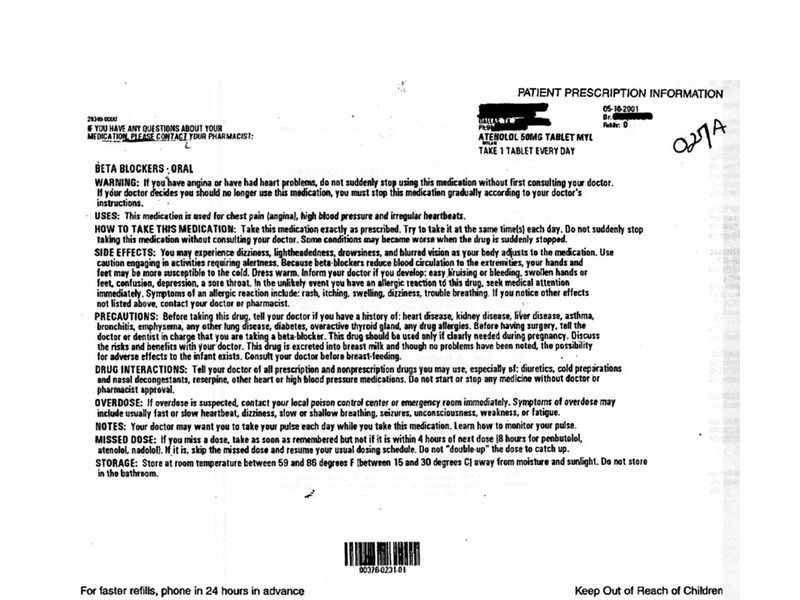 Overview of Aspirin and NSAID’s Label Warnings William E. Gilbertson, PharmD. 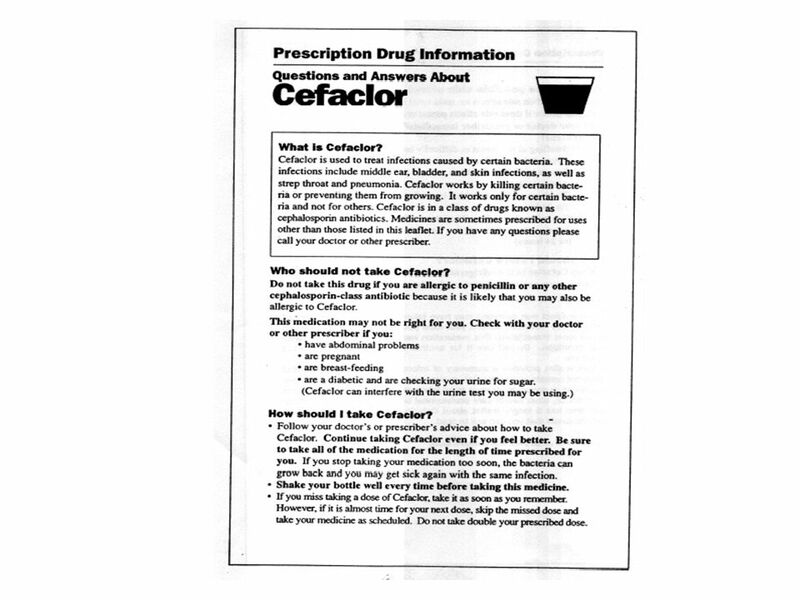 Division OTC Drug Products 1. BELL WORK Do you think prescription or over the counter medicines are more harmful than street drugs? Explain your answer. 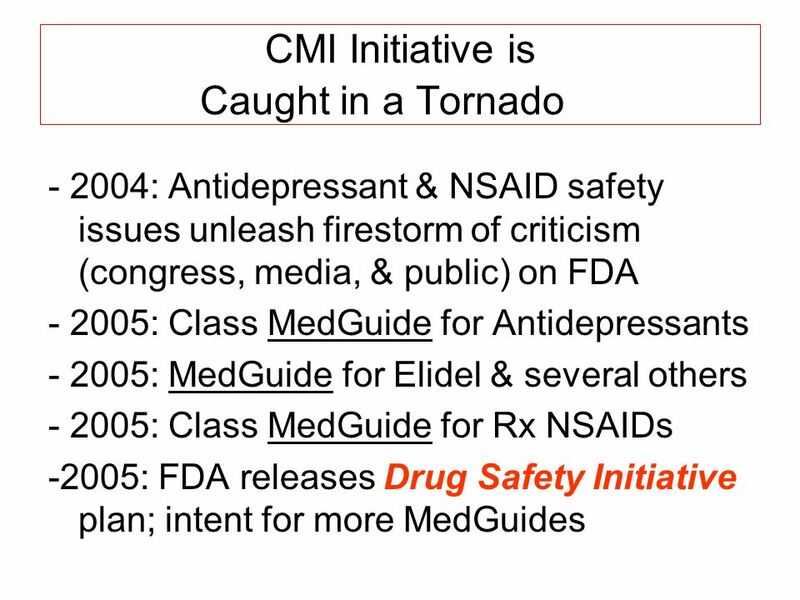 Copyright © 2013, 2010 by Saunders, an imprint of Elsevier Inc. Chapter 71 Cyclooxygenase Inhibitors: Nonsteroidal Anti-Inflammatory Drugs and Acetaminophen. 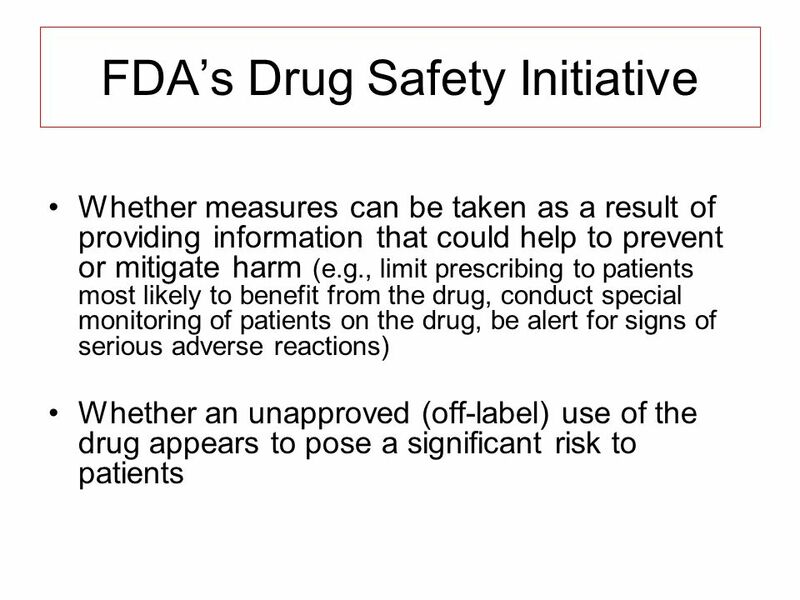 Introduction Medication safety is a critical aspect in improving the health of individuals and increasing their quality of life. 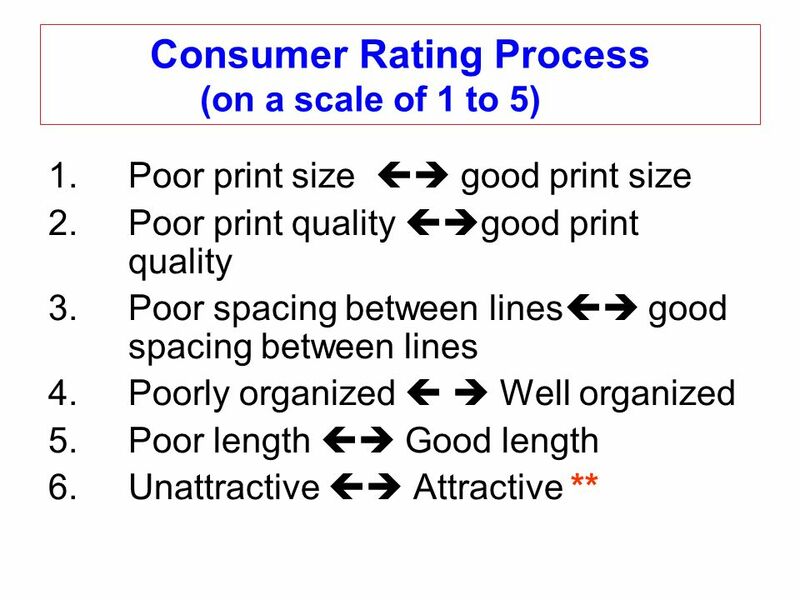 When used in the proper. Sudden Illness When illness happens suddenly, it is hard to determine what is wrong and what you should do to help.